A tasty penne dish, a classic sauce, and just enough kick to get attention! A simple one-pan pasta dish was exactly what I needed after a fun but busy weekend. I spent all day yesterday in New York City for a cousin’s bridal shower, then spent the next day catching up. 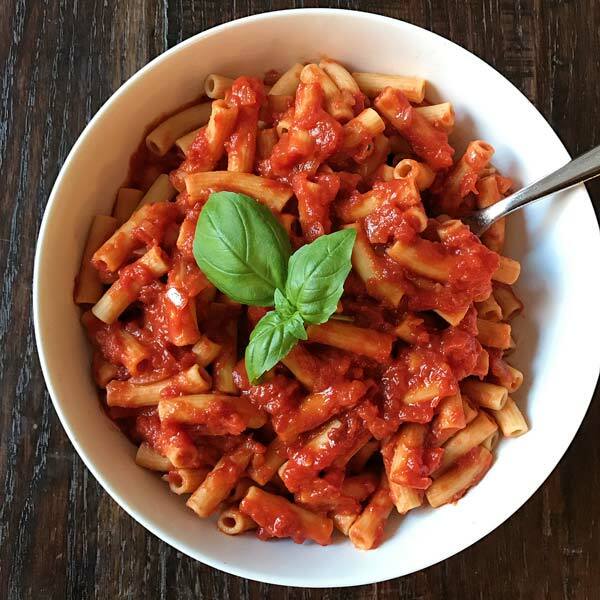 And there’s nothing better than a simple Spicy Arrabiata sauce to cap off the weekend! I served it with Eat Banza chickpea penne. Top things off with fresh basil or parsley if you like. It’s easy, cozy and delish — a perfect closer to a great weekend! Top things off with fresh basil or parsley if you like. It's easy, cozy and delish — a perfect closer to a great weekend! Sauté onions with a pinch of salt until translucent, about 10 minutes. Add garlic and crushed red pepper. Sauté until just fragrant, about 1 min. Add in chopped tomatoes and bring to a simmer. Add bay leaf, salt to taste and let simmer for at least 30 minutes. Remove bay leaf and serve with pasta of your choice. Top with fresh basil or parsley as desired.